So charming, its sure to bring happiness to whomever you send it! 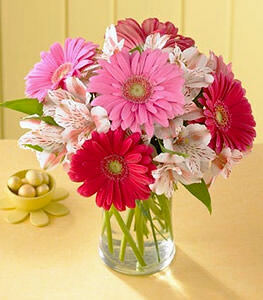 A delightful bouquet consists of dark and light pink Gerbera daisies offset by white with pink alstroemeria. This item is professionally arranged and hand delivered to the recipient by our local florist. Since only the freshest and highest quality items are selected, colors and/or varieties may vary. Container may also vary. The flowers I ordered for my sonýs viewing completely surpassed my expectations. Thank you so much for providing great service and a quality product during such a difficult time for my family. I just wanted to say thank you for the excellent service. My friend rang from California earlier today absolutely delighted with the chocolate basket. He was particularly impressed that you had decorated the basket in the " Cal" colours. Her son had not yet seen the basket when she rang, but she was sure he was going to be thrilled. I had been a bit nervous about ordering over the internet, but am really happy with the result. Thank you for taking the time to do a great job.